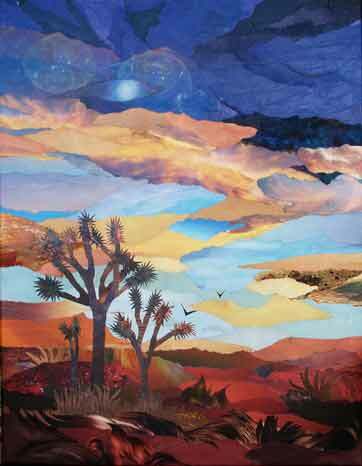 The desert is an endless inspiration for my paintings of scenery, animals, and plants. Sunrises and sunsets are never the same in the desert. They inspire gorgeous coloring. The materials I use are oils, acrylics, watercolors, gouache, and airbrushing. Collage is painting with paper. My pictures are made mostly of cut or torn colored areas from magazines. These paper scraps provide a ready-made variation of colors that would be difficult to mix with paint. Handmade oriental papers and hand-painted tissue papers are also used. Gilded sunsets and sunrises were inspired by sheets of gold leaf given to me by a Vietnamese student. I credit Sister Corita Kent with introducing me to collage at Immaculate Heart College.